A light, shifty and bracingly cold wind from the north, combined with a substantial tide made for challenging conditions on the opening day of the RORC Easter Challenge. Racing started on time at 1300 and with the wind rarely getting above 6 knots, the tide was a vital factor, ebbing throughout the afternoon at more than 2 knots (and due to increase, with a 4.9m spring tide occurring on Sunday). “The tide was a pretty major factor, particularly at the starts and some of the laylines in the second race,” commented Luke McCarthy, Racing Manager and Head Coach at the British Keelboat Academy. 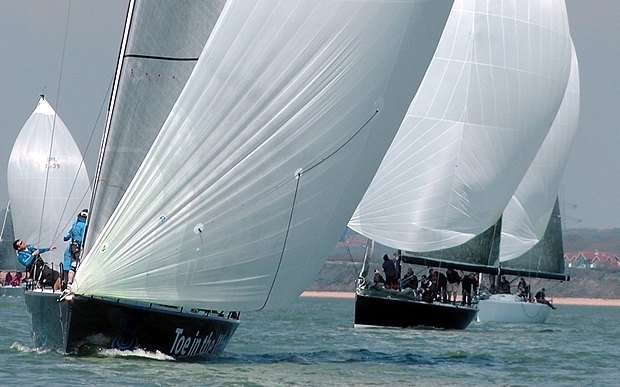 Based in Cowes, the BKA trains young sailors aged up to 24 to become professional racing keelboat crew and is fielding five boats at the RORC Easter Challenge. This involves 35 sailors, almost the entire BKA squad. Biggest in the BKA fleet is the Farr 45 Kolga, offered to the Academy by Niklas Zennström and today the young sailors on board were racing with round the world legend Steve Hayles, usually navigator for Niklas Zennström on his various Rán yachts. After racing today, Kolga is sixth overall in IRC One, while her sistership Simon Henning’s Alice is leader. “It is great to have Steve Hayles from Rán Racing on the 45. He felt they were sailing the boat pretty well,” says McCarthy. In addition to the BKA’s three J/80s, they are also campaigning David Aisher’s J/109 Yeoman of Wight in IRC Three, on which Luke McCarthy is sailing this weekend with a BKA crew. After today’s two races they lead IRC Three. In race one they demolished the opposition, finishing more than six minutes ahead on corrected time and this was despite being over early at the start. “We always wanted to go right up the beat and we piled in there and pushed hard right and then we just extended after that,” said McCarthy. In the second race Yeoman of Wight finished fourth after they and a number of other boats were involved in a big pile up at the pin end of the start line. McCarthy attributes their success partly to the four weekends of training they have put in over the last six weeks and their J/109 also perhaps benefitting from being rated with slightly larger jibs than the six other J/109s racing here. Today’s second race in IRC 3 was won by the Corby 33 Salvo with the MAT 1010 Matilda second, unusually both boats having skippers called Peter Morton, the latter currently tied on points overall with Yeoman of Wight. Another significant presence on the water at this event is the biggest boat in the fleet, the dark grey Farr 52 that has previously been known as Bear of Britain and subsequently Bob. Earlier this year owners Tony Hayward, Sam Laidlaw and Rob Gray donated the boat to Toe in the Water, the charity which uses competitive sailing as a vehicle to re-inspire injured servicemen and women. At the RORC Easter Challenge, Toe in the Water is being steered by Brian Thompson, who most recently set a new record aboard the 40m trimaran Banque Populaire for being the fastest to sail non-stop round the world. On this their average speed for the 45 day long voyage was 26.5 knots, so today’s racing perhaps lacked a little pace in comparison. “I am steering the boat and you are doing all the very fine details, upwind and downwind, so it is a different sport. And it is very nice to sail with those guys,” says Thompson, who also has fellow Vendee Globe skipper Dee Caffari in the afterguard – both are Toe In The Water ambassadors. This is the first time Thompson has sailed the boat, while the crew has only been out on two selection weekends. Among the Toe in the Water crew are volunteers from the charity, but also four injured servicemen including Lance Corporal Steve Palmer of the Royal Engineers who lost both his legs in Afghanistan, Lance Corporal Chris Herbert of the Yorkshire Regiment who had one leg amputated in Iraq and Private Metiisela Ladiniwasa, RSU Germany and Private Chris Skelton of 23 Pioneer Regatta who both have severe lower limb injuries. Despite the lack of time on board, Toe In The Water is lying second overall, tied on points with Alice. Approaching low tide during race two, a number of boats went aground on the Brambles Bank, including the J/133 Jeronimo and the Farr 45 Espresso Martini, who retired from the race, while Tonnerre, like Toe in the Water, also grounded after the finish. In IRC Two Jim Macgregor’s Poole-based Elan 410 Premier Flair leads, while in IRC Four A Grant Gordon posted a pair of bullets aboard his J/97 Fever while Nigel Biggs had a similar result in IRC Four B on his Checkmate and Robert Larke has aboard J2X in the J/80s also leads on minimum points.